This is the follow-up to When I Get Lunch. In my more formative years, the show How I Met Your Mother was an amazing sitcom. 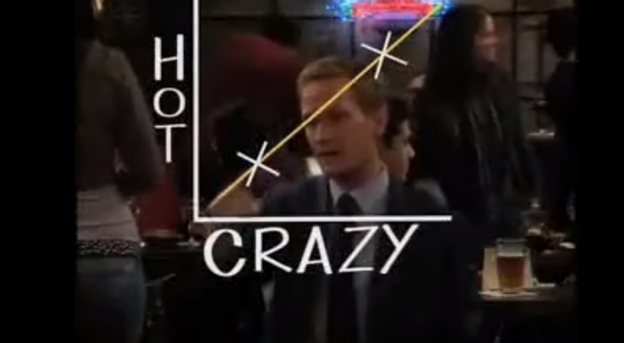 When the show was still in the phase where it was somehow more often than not ridiculously funny, in season 3, episode 5 (I had to look that up), Barney introduced us to the Crazy-Hot scale. The basic idea is that there are sometimes direct tradeoffs between two variables, in this case, mental stability and attractiveness in the dating market. If someone is above the line, it means that along these two dimensions, their relevant positive trait outweighs their negative trait in the category under consideration. The higher one variable is, the higher another must be to make it a viable option. Having been happily absent from the dating market for many years, I have taken to applying this trade off when considering food. The first relevant variable is how the food tastes. Like attractiveness, the tastiness of any given food item is subjective, though with considerable consensus around different food types. The directly relevant tradeoff for how tasty any given food type is how healthy it is. There is considerable debate and disagreement about what people consider healthy. Judging by its popularity in supermarkets, many consumers still look for “fat free”, while that is a label that tells me to look elsewhere. Either way, it’s far too often the case that things which taste good are unhealthy for us, especially when we consider the quantity of unhealthy food that we are tempted to consume. 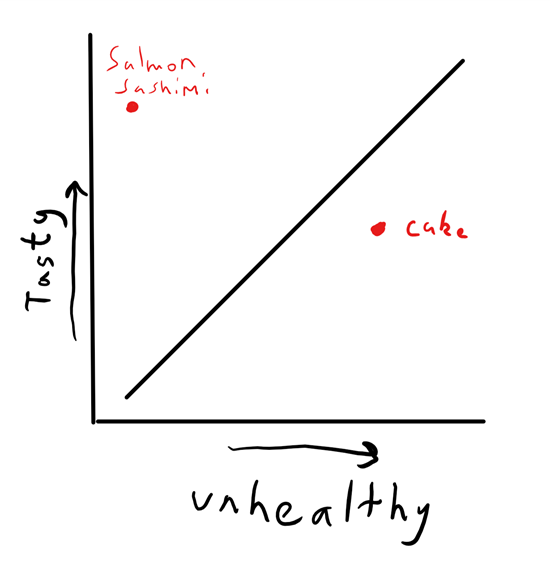 In this case, salmon sashimi is comfortably above the line while in my case, cake is comfortably below the line. While it would be nice to standardize this metric, it’s going to vary unavoidably from person to person. My taste bias is generally towards spicy food and oriental cuisine. My health concerns are generally centered around avoiding excessive carbs and sugar. The line is not always stable. If a woman becomes pregnant, that salmon sashimi which seemed like a great way to get protein and omega-3 now looks like a high-risk food item where the small chance of trichinosis or other parasites is too much of a risk, regardless of how tasty it is. Someone who loves pizza, but who goes on a low carb diet, will start seeing pizza as laying on the opposite side of the line compared to when they were not on a diet. 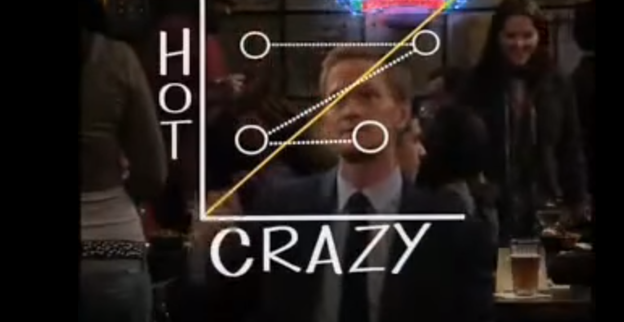 The fictional Barney Stinson named his trade-off line the “Vicky Mendoza line” his fictional ex-girlfriend whose cosmetic and behavioral changes caused her to fluctuate between the zones. 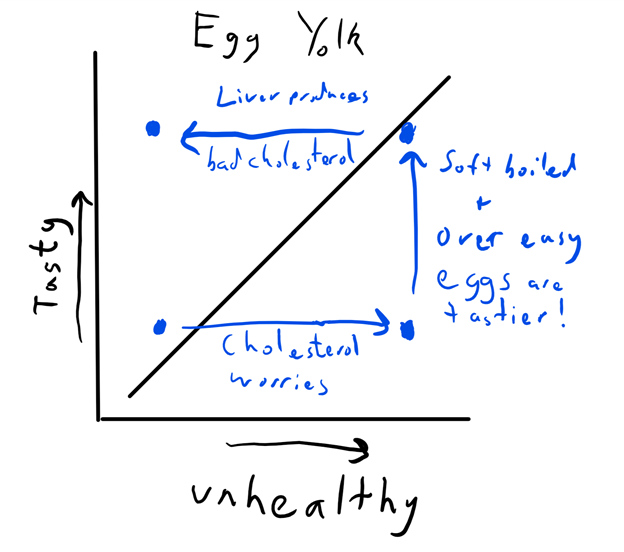 The closest food analogy might be the egg yolk. At a young age, scrambled or hardboiled eggs would be served in the morning. These eggs were not particularly tasty, but they were seen as relatively healthy. Then, doctors became more concerned with the cholesterol in egg yolk. Eventually, I discovered the wonder that is soft boiled eggs, particularly in ramen noodles (Ramen is probably somewhere in the upper right of my chart, if I don’t eat most of the noodles I can pretend it is on the upper side of the line). And scientists have started to come to the conclusion that identifying bad things in the body and tying them directly to things that are eaten, like cholesterol, might be oversimplifying our body’s very complicated mechanisms. Dietary cholesterol from eggs is generally not thought to be as bad for the general population as it was twenty years ago. With Thanksgiving coming up, it is worth thinking about why America’s feast meal traditionally involves some of America’s most mediocre food. My relatives are generally great cooks, but Thanksgiving is a category where almost every single dish is either on the line or below the egg-yolk line. It’s inaccurate to say that rituals don’t evolve over time, but they do evolve more slowly than the rest of culture. While some families have modernized their various parts of their Thanksgiving food, it is still a window into what food was like a generation ago. Turkey – The main dish consists of a meat that is seemingly only popular now and during Christmas, its defining factor is its ability to put you to sleep. The only real turkey enthusiast seems to be Michael Dukakis. Mashed Potatoes – Basic starches that are sometimes made edible with enough salt, butter and gravy. Mashed Sweet Potatoes – There is some potential here, if not for the marshmallows that drive this dish firmly to the left of the egg-yolk line. Stuffing – Made properly, these are better tasting carbs, made even better with gravy. Gravy – The only thing that makes it worthwhile to think about eating the above dishes. Cranberry Sauce – This tangy collection of sugar is adored by many people in the thrall of nostalgia. In fact, outside of pie enthusiasts, most of the appeal of the Thanksgiving meal appears to come from nostalgia. Before condemning me as un-American, look into your heart, you know this is true. Or better yet, look at popular restaurants across America. There are very few chain restaurants whose thesis is that they should serve Thanksgiving food year-round. And those that do, like Pluto’s, survive mostly due to the popularity of their salads and simple meat options. It takes a lot of self-brainwashing to convince yourself that salads are anywhere other than the lower left side of the tasty-unhealthy chart – except for the ones at risk of being on the wrong side of the line in the lower-right due to a heavy reliance on tortilla chips, fried meat or an unhealthy dressing. A two by two matrix often oversimplifies things. Maybe the most important trade-off isn’t between hotness and craziness, but between social status and wealth. 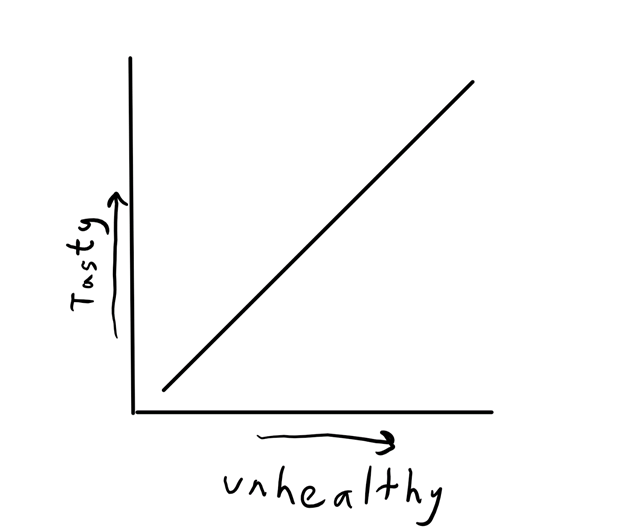 The nice thing about the tasty-unhealthy framework is the axes can contain most of the complicating variables. The hungrier you get, the better certain foods taste. Or maybe almost all food is seen as unhealthy at meal time if you have decided that intermittent fasting is important. Someone who discovers they suffer from Celiac disease should relocate everything that has gluten to the far right of the chart. Maybe you don’t usually eat cake but make exceptions for friend’s weddings – you can incorporate the desire to be properly sociable into the tasty side of the scale. Or just throw it out during cheat days or cheat events. The important thing is having a framework that is generalizable enough to handle new information and new constraints properly. The best approach would be if we were capable of brainwash ourselves into only liking healthy food and constrain our diet to the upper left side of the quadrant, but that is easier said than done. It may be most useful in avoiding borderline foods when we know it’s not good enough for its health levels. So when someone asks you why you don’t like pizza, you can tell them “Yes, I like pizza. But I don’t like it enough considering how unhealthy it is for me.” You can even draw it out, using slightly better handwriting than my own. But this is advice on how to think of the trade-offs between enjoyable and healthy food, not on how to lose friends and bore people.